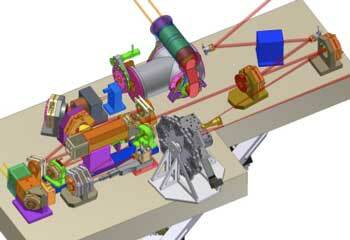 The science instrument for GPI is an integral field spectrograph based on a lenslet array. The integral field nature of the instrument allows for a full mapping of the focal plane at coarse spectral resolution. With such a data cube, p within the PSF such as residual speckles can be suppressed. Additionally, the initial detection of any candidate planet will include spectral information that can be used to distinguish it from a background object, and candidates can be followed up with detailed spectroscopic observations. A lenslet design is chosen because it is intrinsically low in wavefront required 40,000 field points. Lyot Wheel – A wheel in the pupil plane with 8 positions containing Lyot masks of different aperture diameters to allow selection of how much of the pupil to remove from the outer edge. Pupil Viewing Stage – A two position stage to insert and remove a pick-off mirror to direct light into the pupil viewing camera. It will be after the Lyot wheel and before the lenslet array. It will be out of the beam for normal operation. Filter Wheel – A wheel mechanism containing at least 8 positions located between the spectrograph collimator and camera. Undisperser-Polarization Stage – A two position stage between the spectrograph collimator and camera to insert a prism that “undisperses” the light and a Wollaston prism to separate different polarizations. It will be out of the beam for normal operation. Detector Focus – A single axis linear stage to move the detector along the beam axis. This is anticipated to be necessary only during assembly and alignment. The motor will either be removed or prevented from normal activation once the IFS is delivered. 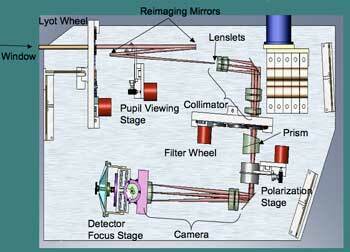 Optical design of the GPI science camera. This animation shows a GPI simulated data cube. Each frame represents a small step in wavelength. Note how one planet (lower left of the star) winks in and out of the animation, while the other (above the star) gets brighter very slowly. 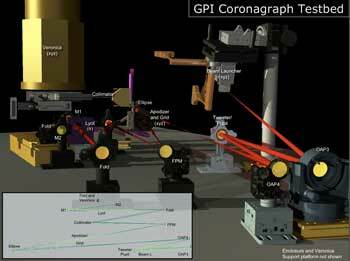 This is how GPI will deliver near-infrared spectra of exoplanets.